A lot of rain in a short time. This is what the southwest monsoon looks like. UMass announces schedules for certificate programs. Shade and photosynthetic light in Sydney. New turf disease publications from Purdue. Soil temperature and fairway management in a classic article by Oscar Miles. Jason Haines on why he uses growth potential scheduling for fertilizer. Reasor et al. on the variability of Cynodon on putting greens. A hypothesis about the most sustainable grass. The photosynthetically active radiation (PAR) changes at a location by time of year and by cloud cover. This animated chart shows what the average photosynthetic photon flux density (PPFD) would be for every 5 minute interval in clear sky conditions, and also shows what the actual PPFD was. Adding up the PPFD from every second gives the total PAR for a day -- the daily light integral (DLI). This chart shows potential DLI under clear sky conditions, as well as actual DLI. Mike Richardson pointed out that the growth rate of zoysia is less than bermuda, so by implication there must be something other than growth rate that allows zoysia to invade bermuda. That is, in the situations when bermuda and zoysia are growing together -- competing -- when zoysia appears to grow faster, Mike suggests it may be a factor such as turf density that allows such a result, because bermuda grows faster than zoysia. I've outlined a hypothesis about grass growth rates and their required inputs, and have more to write about that later. In that hypothesis, I mention location, and in my recent discussion with Mike about the growth rate I said that there is a variety by climate interaction. By climate, I mean the same as location. I'll use these words interchangeably. Let me try to explain what I mean by an interaction by climate. I'll use data from Tokyo, and from Batesville (2016 data) and Fort Smith (climatological normals data). These locations are all about 35°N. Light, temperature, plant water status, and leaf nitrogen content all influence growth. In turfgrass management, light and temperature generally can't be controlled; plant water status and leaf nitrogen content can be modified by turfgrass managers. We can imagine that bermuda and zoysia are growing side by side, or together, and then think of what may happen with modifications to these growth-influencing factors. On average, this is the part of the climate that can't be controlled, at Fort Smith and at Tokyo, shown in 2-dimensional space. That's a similar temperature range but different amounts of sunshine. Thus, there is no overlap during the months when warm-season grasses are growing. I focus on light and temperature because the water and the nitrogen can be adjusted by the turf manager. Temperatures for 2016 are pretty similar through July 30. I express temperature here as the cumulative sum of growing degree days. Ok, so temperatures are similar. If it were only temperature that influences growth, one would expect the grasses to perform pretty much the same at these locations. If bermuda does have an inherently faster growth rate than zoysia, then in this side-by-side comparison, with the same temperature, then bermuda should grow faster at both locations. I downloaded the global solar radiation data also and then converted it into photosynthetic radiation units. This is Batesville for the first 7 months of 2016. This is Tokyo for the first 7 months of 2016. In 2016, there has been more photosynthetic light at Batesville than at Tokyo. The DLI was pretty much the same from January to March, but since the start of April Batesville has jumped ahead by about 1,000 moles/m2. In the past 4 months, Tokyo has accumulated about 4,000 mol/m2 and Batesville has accumulated about 5,000 mol/m2. That's a log percentage difference of 22%. The difference has been especially pronounced in June and July -- the hottest months of the year so far. Imagine growing bermuda and zoysia in 10% shade at the same temperature. Bermuda may grow faster than zoysia. Now imagine 20% shade. Probably the same result. How about 30, 40, and 50% shade? 60% or 70% shade? At some point, the growth rate of zoysia will be greater than the growth rate of bermuda. The bermuda will die in shade under which the zoysia can still produce a turf. Consider now that there are varying growth rates among bermudagrass varieties, and also among zoysia varieties. 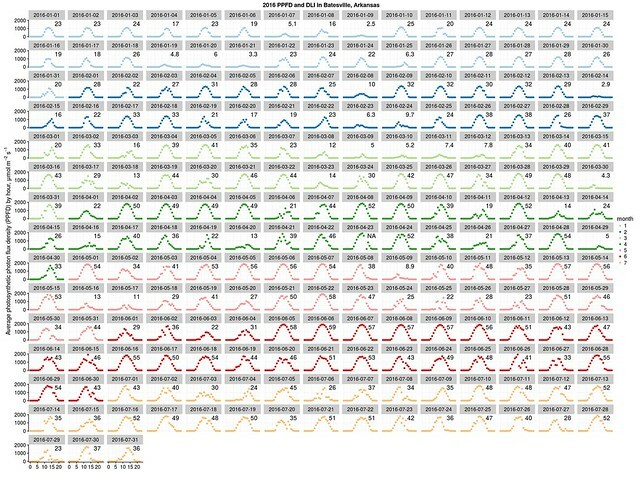 That's what I mean by the location (or climate) by variety interaction. Take an inherently faster-growing zoysia, mix it with bermuda, grow it in a climate with high temperatures combined with lower DLI, mow the grass and make sure plenty of water is applied during the dry season, and see which one grows faster. It's not bermuda. Yes, with a high DLI, plenty of fertilizer, moderate water supply, and high temperatures, bermuda grows faster than zoysia. 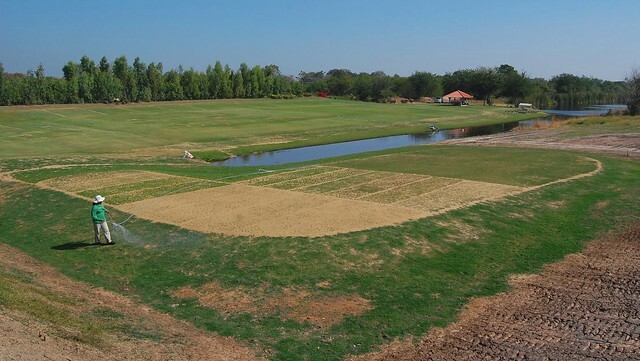 Here's a photo of the ATC research facility putting green during grow-in. It's easy to tell which plots are zoysia -- those closest to the camera. But if one thinks of growth as something that happens over years, at a location, with the grasses maintained as turf, then one can find the growth rate of zoysia can be higher than that of bermuda. I find it useful to look at growth rate in those terms, rather than trying to explain it as a response to density or as competition for some other factor. "Given adequate moisture is present, and no air movement, the turf canopy temperature is 15 F higher than the air temperature in full sun." I was surprised by that, because I've been measuring air temperature and surface temperature occasionally since 2014 and I have not measured a single turf canopy in which there was a 15 F difference. I make my measurements in the C scale, and 15 F is 8.3°C. The highest increase I've measured in canopy temperature over air temperature is 6.6°C. Here's the data I'm working with from multiple days in 2014, 2015, and 2016. These are 50 measurements from putting greens in Thailand and Japan, sometimes in full sun and sometimes cloudy, with these temperatures, humidity, and wind. Grasses are bermuda, seashore paspalum, and korai. The range in air temperatures is 25.9 to 35.1°C (78.6 to 95.2°F). The range in humidity is 44.3 to 81.9%. The range in surface temperature is 24.3 to 39.5°C (75.7 to 103.1°F). For the data I've measured, it doesn't seem like wind speed has a huge effect. The wind has ranged from 0 to 4 m/s (0 to 8.9 mph). I've only got wind speed for 23 of the 50 measurements. Here's the difference between air temperature and surface temperature. These aren't all in full sun, because there was sometimes cloud cover, but many are in full sun, and there is nothing that reaches an 8.3°C difference, which is what one would expect if the Tech Note was correct that "the turf canopy temperature is 15 F higher than the air temperature in full sun." After I asked "Really?" about this difference, Turf-Vu sent me data from their Hawk-Eye system and suggested a certain day to look at as being sunny and low wind. 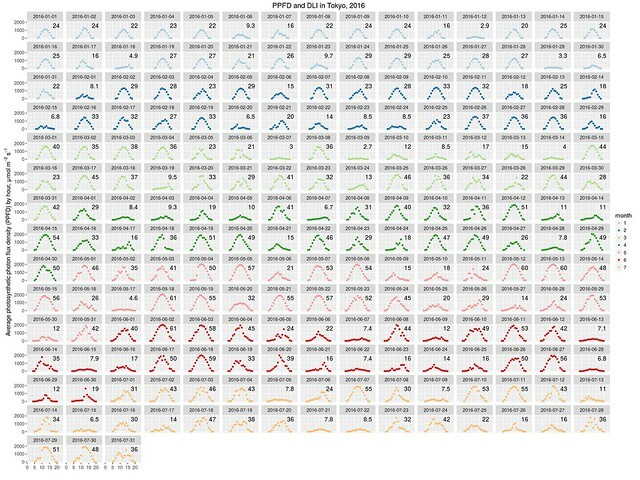 I looked at the example air and surface temperature from Turf-Vu for July 28. Then I plotted the difference. On a celsius scale, compared to my data by time of day, this shows that almost all my measurements have a smaller difference between surface and air temperature. Either my thermometers are off by a few degrees, or there are often situations in which the turf canopy temperature is less than 15 F higher than the air temperature in full sun. Species effect, perhaps? Or cool-season versus warm-season grass? This video from PACE Turf has more info about temperature, air movement, and cool-season grasses.